The P&S Paint Gloss Showroom Spray N Shine is a quick detailer designed to help you clean and protect in one easy to use product! Even a well-protected vehicle eventually loses its luster after being exposed to the everyday elements. When this happens you can perform a full detail, or use an instant detailer like this to help you cleanse the surface and restore some gloss. This option will help you extend the life of the protection on the surface, carrying you longer until you need to perform a full detail again. The P&S Paint Gloss Showroom Spray N Shine is versatile spray on product that not only removes dirt, fingerprints, dust, and smudges, but can also act as a clay lubricant. Simply spray this product onto the surface, working panel by panel, wiping away the excess with a clean microfiber towel. Always work on a cool panel and out of the sun. 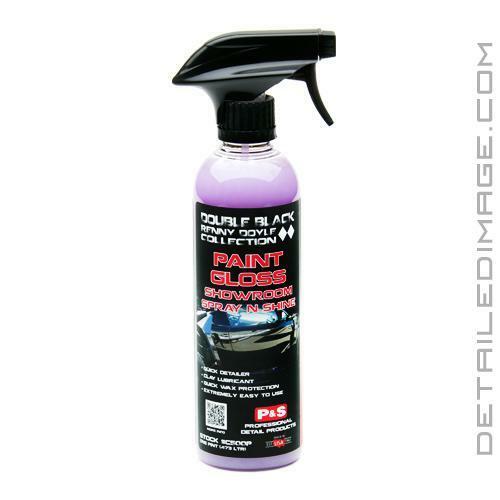 If you are looking for an easy to use quick detailer that also leaves behind some protection, pick up the P&S Paint Gloss Showroom Spray N Shine! Paint Gloss removes dirt, fingerprints, dust, and smudges without having to complete a full detail. A water based product for spray application to maintain and enhance paint surface on freshly or lightly soiled vehicles. Paint Gloss is formulated to work as a paint lubricant with clay or clay related products. A great touch up product for use on all vehicles. Wash vehicle prior to product application. For best results, apply to cool paint in shaded area. Spray apply a light mist of Paint Gloss to a 2' x 2' paint surface. Wipe area with clean, dry microfiber towel and polish to gloss. Use Paint Gloss with microfiber detailing cloth to enhance overall product performance. Use generous amounts of Paint Gloss when using as a clay lubricant to provide sufficient lubricity for removing contaminants from the surface of the vehicle. Yes, this is a must have at any car show or event. It goes on very easy and it dries as fast and leaves a smooth mirror glass finish shine on your vehicle. I love this product. Yes and in a heartbeat! This product goes on easy, wipes off easy and doesn't streak. Big bottle for a fair price. Great value for the money. Yes but I think there are other detail spray better for the money.